Please NOTE - This is an HDMI Switch is used to toggle between multiples sources (such as a BlueRay Player, Cable Box, or Satellite box) and connect to a SINGLE HDTV. The use of a higher-grade cable when using a switch is highly recommended due to the added resistence of connecting your devices through multiple ports. A switch should not be confused with an HDMI SPLITTER (which is used to connect a single HDMI source devices to multiple HDTVs). This 3-port HDMI switcher allows you to connect three disparate HDMI jacks into one HDMI output, with an included wireless remote that allows you to switch between each device without ever leaving the comfort of your sofa. Simply turn on whatever device you wish to use and the switcher will draw power directly from the connected devices, with LED lights that illuminate whichever port is currently in use. Comes with IR Remote control, switch the input source conveniently. Able to connect up to 3 HDMI devices to just 1 HDMI port on your HDTV/monitor. Support 1080p Full HD 3D and 12-bit deep colour, retaining the crispy clear images. No downsizing nor conversion, no compromise in quality. Mini size so it doesn't occupy much space or look messy. Maintains high resolutions up to 1920 x 1200. 5V DC power jack is recommended if you're using the switch with an HDMI cable over 50 feet long. 1 x 1080P HDMI 3 Port HDMI Switch Hub. 1 x IR Remote for HDMI Switch Hub(with icon Battery). 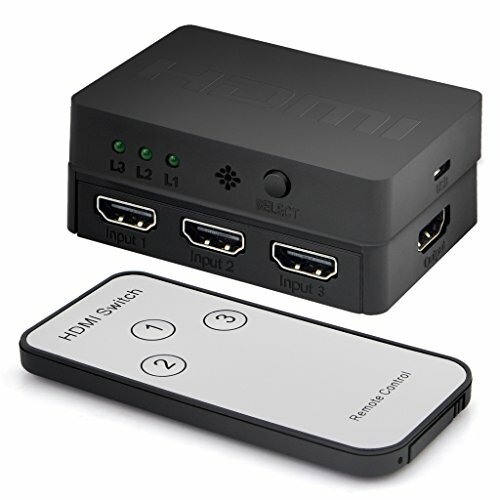 This 3-port HDMI switcher allows you to connect three disparate HDMI jacks into one HDMI output, with an included wireless remote that allows you to switch between each device without ever leaving the comfort of your sofa. Simply turn on whatever device you wish to use and the switcher will draw power directly from the connected devices, with LED lights that illuminate whichever port is currently in use. Able to connect up to 3 HDMI devices to just 1 HDMI port on your HDTV/monitor.Automatically switch to the device that is powered on first. Please NOTE - This is an HDMI Switch is used to toggle between multiples sources (such as a BlueRay Player, Cable Box, or Satellite box) and connect to a SINGLE HDTV. A switch should not be confused with an HDMI SPLITTER (which is used to connect a single HDMI source devices to multiple HDTVs).